It’s late night in a Chicago press room in 1939. Camped out in city hall, with the condemned cell behind a door and a gallows outside the window, reporters from the city papers are waiting for a hanging. Hildegard Johnson (Jane Pfitsch), once the best journalist in the city, drops in between trains to say goodbye to the newsroom, on her way to marry Bruce Baldwin (Mark H. Dold). Hildy walks into what could be the biggest story of her career. Her former husband and editor, Walter Burns (Christopher Innvar), believes the condemned man is a political target, and he wants her help — at the risk of her engagement, her liberty and her life. In “His Girl Friday” at Barrington Stage Company through Aug. 30, John Guare has adapted a new script from Ben Hecht and Charles MacArthur’s 1928 Broadway comedy “The Front Page” and the 1940 screwball film version, “His Girl Friday” with Cary Grant and Rosalind Russell. Guare sets the action on the edge of World War II. It’s a comedy and at times a classic farce — the incompetent sheriff, the battle-axe mother-in-law, the press hacks, Walter’s antic attempts to separate Hildy from mama’s-boy Bruce. But the comedy plays against a serious background. An anarchist Jew is condemned for shooting a policeman who would have shot him; political corruption and fear are driving a Chicago election; Franklin Delano Roosevelt, facing the Depression, urges the U.S. to war, as Hitler comes to power in Germany; the rookie reporter whose wife is about to have a baby could be drafted before his children are old enough to walk. Farce at its strongest often has a hard edge. It sets you laughing and then hits you with something real under the laughter. This cast made even purely comic characters three-dimensional. Bruce Baldwin, coming out with his pat political views, could have sounded simply ridiculous, but Dold made him chilling. His unthinking hard-line stance is frightening here — a town thinking like this has set up a man to be hanged, and a country thinking like this has put the Nazis in power. Actors given more range moved smoothly between slapstick and depth. The banter between Hildy and Walter became funniest when they held respect within it, and they made the present vibrate with their shared past. Walter has an editor’s energy and will to make change. Innvar brings out beautifully the honest newsman soured by cynicism. The newsroom crew are comic hacks: They make up events, investigate nothing and repeat whatever line the mayor gives them. Theirs isn’t the cynicism of the cops-and-courts guy who has seen too many shoddy cases — that guy still calls the DA’s office and challenges the cops. These guys are too jaded or too scared for their paychecks to do their jobs. In their way they are as frightening as Bruce arguing America should sell arms to Germany. With Rocco Sisto, the Sheriff, to bait, they are also as darkly funny. Set against them, Walter stands up for the ethics of journalism. At his best he has the courage to defy the political structure. At his worst he sounds like the arrogant, poker-playing pressmen with their casual racism. At times I knew why Hildy had left him, and at other times I knew why why she had married him in the first place. Pfitsch plays Hildy with elements of the classic-film woman, bright, powerful and self-doubting, and with her own kind of independence. She is clear-headed, improvisational and always ready to take initiative, and she is wonderfully difficult to con. Walter manipulates her new fiancé because he can’t manipulate her. He gets under her skin in one way — by knowing she loves her work. It is one of the play’s keenest pleasures that Hildy is good at her job. Walter proclaims it. The action revolves around it. Walter wants her back because he wants her, but he wants her to write this story because she can get it better than anyone else. Pfitsch’s Hildy knows how good she is and delights in it. At full stretch she talks down an escaped prisoner with a gun and draws out of him some of the most powerful lines in the play. In a few words he challenges civic authorities, stands up for American values, puts the country on trial for its neutrality in Europe and its treatment of his people, indicts a police officer for fascism and tells his own story. Ethan Dubin as Earl Holub had me riveted as he spoke to her. And the power grew from the dialog. A man shaking with terror may not say all that on his own. Hildy gets him to say it. That’s what journalists do. And then they get the story into the world. If they tell that story strongly enough, Hildy and Walter can save a man’s life, change an election, and even push a country into war. The whole cast moved fluidly between farce and real feeling with sure timing. When friction came between the comedy and the raw action, for me it came from the script. When reality hits hard and then the clowns come, it can be hard to laugh. One of the most dramatic moments in this play, and the saddest, came early in Act II. At a high point after a pivotal scene, a character made a deliberate sacrifice. She hit hard, and she saved a life, for a while. And then waves of comic interruptions flowed in. I was shaken by the powerful opening of the act and the life-or-death struggle it introduces. Coming after that the string of Keystone-cop-style romps began to feel frustrating. The clowns were colorful, razor sharp and even laugh-aloud funny, and Walter’s dodges to outwit them, especially the sheriff, could be gleefully bright — but I wanted the clowns out of the way, to get back to the main action. That sacrifice influenced Hildy and Walter to take their own risks, but it happened in a blink. The chase scenes took the momentum from their choice — and most challenging for me, in the end they made the choice politically irrelevant. The play puts central pressure on Hildy to finish her story and Walter to get it printed. It’s the best lever they have. They want to expose corruption, save the condemned man and keep themselves out of jail, and they have a way to shift public opinion and influence people in power. Walter thunders forcefully about his and Hildy’s responsibility to speak for people who can’t speak for themselves. 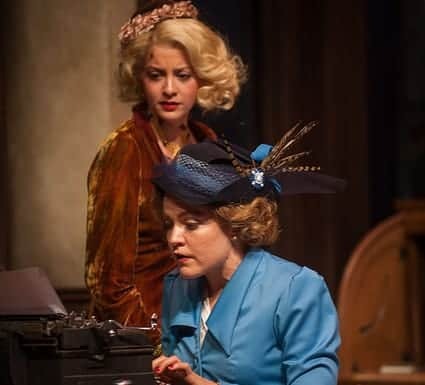 A play centering on the power of the press leads us to want Hildy to write and her story to get published and make a difference. In the time period of the play, Hildy’s decision about the story will make a difference to her own life, her work, her passion. But Guare does not let the news story make a difference to the political action. The newspaper with the damaging story has not yet come out, and the mayor and the sheriff have ample ways to stop the presses. Guare brings in another character and plot element to force the issue, and for me the Chicago plot arc, racing through most of the play, abruptly petered out. Walter and Hildy are coming into their own, finding the truth, protecting the innocent — they crackle with power — and they get a reprieve. They never get to turn that force on the city. They do get to turn it on greater world events and on each other. In the end I believe they know each other well and can change. I also believe they will go on to make a difference in the world, whichever way they go. I believe this night has shaped them. For a journalist, that’s powerful. I left moved, laughing, troubled and glad I came.